While you control a Link Monster, monster your opponent controls cannot target monsters you control for attacks, except this one, also your opponent cannot target monsters you control with card effects, except this one. Once per turn, at the start of the Damage Step, if this card battles an opponent's monster: You can return that opponent's monster to the hand, also, this card can make a second attack in a row. This card is the first Cyberse Synchro Monster. 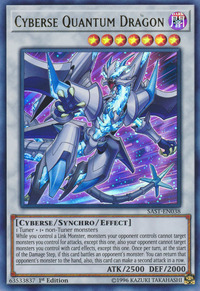 It is also the first Cyber Synchro Monster. This card's name is a reference to quantum computing; a form of computing that utilizes quantum-mechanical phenomena, such as superposition and entanglement. This card has several similarities to both Cyberse Magician and Cyberse Clock Dragon. They all have the same ATK, DEF, Level, Type, and Attribute. They are the first Cyberse monsters of their respective Monster Card types (Synchro, Ritual, and Fusion respectively). 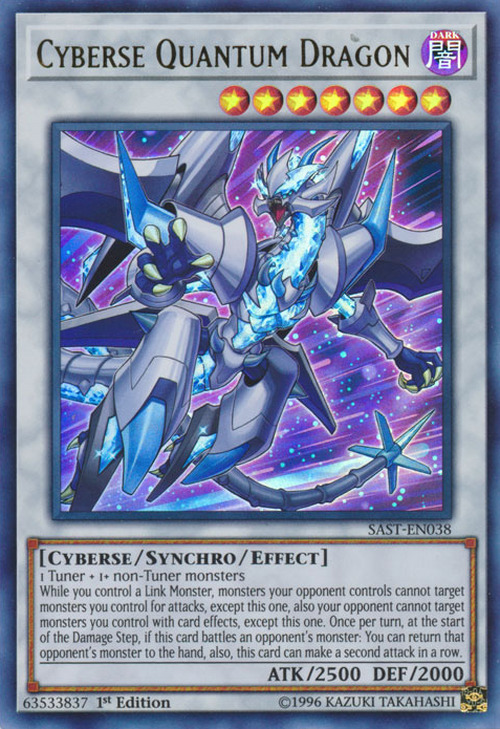 They have the same effect of protecting other monsters against being targeted by an opponent's attack or card effect while a Link Monster is also on its controller's field. This monster resembles both Shooting Star Dragon and Crystal Wing Synchro Dragon.